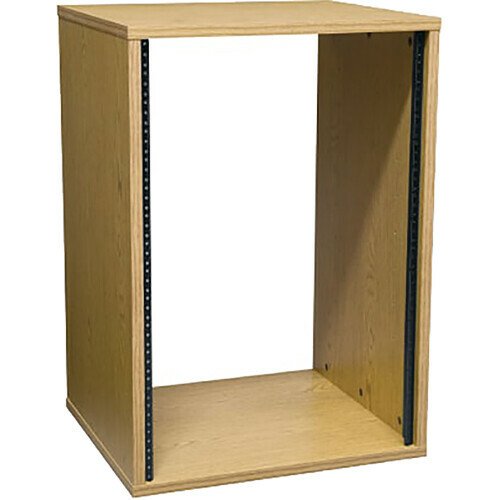 The Middle Atlantic RK/BRK/OBRK/SRK Series 19" Equipment Rack OBRK16 (Oak) is an 18" deep rack constructed from 5/8" furniture-grade MDF board and featuring a high-quality, woodgrain, laminate, oak finish. This rack comes with front, 11-gauge threaded rackrails pre-installed. Assembly is easy and only requires the use of the included hex key. A variety of add-on accessories allow you to customize your rack to meet your exact needs. Choose from doors, rear rackrails, and casters, among other items. 5/8" furniture-grade MDF board ensures years of reliable use. A high-quality, oak, laminate finish provides an elegant look for any work environment. This product is guaranteed to be free from defects in material or workmanship under normal use and conditions for a period of seven (7) years. Dimensions (WxHxD) 19-1/8 x 29-1/2 x 18"
Box Dimensions (LxWxH) 26.0 x 21.0 x 6.0"
Laminate Equipment Rack (Oak) is rated 5.0 out of 5 by 1. Rated 5 out of 5 by petarm from Great rack Easy to assemble. Nice looking.